Find breaking news and videos about wildfires across Western states on http://www.nbcnews.com. Read headlines about uncontained wildfires, evacuations and find wildfire map updates. The latest fatalities brought the statewide death toll to 31, after the Woolsey Fire in Southern California killed two people. "The whole lower side of Paradise is totally engulfed in flames right now ... Not one home will be left standing. I'm devastated." Some of the wildfires that engulfed California a year ago were caused by downed power lines and damaged electrical equipment. "Investigators believe superheated pieces of a catalytic converter came into contact with dry, roadside vegetation," the U.S. Forest Service said. The fire shut off access to Yosemite National Park's biggest attractions at the height of the summer season. The state's fire and forestry department said it was "deeply saddened" by the firefighter's death and was investigating the circumstances. Cal Fire pushed projected containment of the 290,000-acre Mendocino Complex of fires off until next month at the earliest. More than 14,000 firefighters are now battling over a dozen major blazes across the state. "Everything is extremely dry. It's like the perfect recipe for a major fire," a fire official said. "'Extreme' is not even the right adjective to use anymore. It is just an understatement," a fire official said. Firefighters toiled in stifling heat Saturday on the lines of wildfires, making progress against some while struggling to tame others. A fire chief in Santa Barbara County said that had people not have left ahead of a new blaze Friday night, there likely would have been deaths. California Gov. Jerry Brown has declared a state of emergency, citing "extreme peril" to people and property. "I could care less who owns the house," one firefighter said. "I just want to save as many people as possible." The so-called Thomas Fire burning since Dec. 4 was at 273,400 acres Friday, larger than the Cedar Fire in 2003 that burned 273,246. Firefighters have contained 50 percent of the huge Thomas Fire in Southern California, and expect the blaze to become the largest in recorded state history. Fire-ravaged debris still litters many neighborhoods in Northern California, where 44 died and more than 6,000 homes were destroyed in October. 'As of this morning, we're at 259,000 acres and still growing,' a fire official said Saturday. Surfers in a California seaside community hit the beach to catch waves, despite smoke-filled skies from a looming wildfire. Southern California entered a second week engulfed in flames. The Thomas Fire has destroyed nearly 800 buildings, sending thousands fleeing. An illegal cooking fire at an encampment near a Los Angeles freeway sparked a fast-moving wildfire last week that destroyed homes in tony Bel-Air and closed down a major freeway, authorities said Tuesday. Viral sensation, Oscar Gonzales, saves rabbit from blazing Thomas Fire after spotting the small animal on Highway 1 near La Conchita, CA. California Gov. Jerry Brown described the devastation left by the Thomas Fire as "a horror," and said climate change will make fire conditions worse. A 70-year-old woman died in a car crash along an evacuation route from the Thomas Fire burning in Ventura County, a coroner's office says. Southern California is suffering a wave of wildfires, two months after Northern California suffered the same fate. But many are staying, out of love and habit. Erratic winds are feeding the wildfires, which have blanketed coastal Southern California in thick smoke and blown hot embers onto rooftops. A new, out-of-control wildfire roared into life near San Diego, fueled by the hot, dry Santa Ana winds. California wildfires that have burned 200,000 acres showed little sign of abating as a new fire menaced Camp Pendleton and killed at least a dozen racehorses. Ferocious winds in Southern California have whipped up an explosive wildfire, prompting evacuation orders for thousands of homes. The Southern California wildfires that have devoured a big swath of Ventura County are now threatening some of Los Angeles' toniest neighborhoods. The Thomas Fire has already forced 27,000 people to evacuate their homes as the blaze ripped through 55,500 acres. Several thousand fraudulent claims for disaster relief have been filed with FEMA, using breached information of California residents in areas hit by wildfires. In a geographic twist of fate, Northern California's wildfires charred some vineyards and buildings while leaving others almost unscathed. Santa Ana winds and extreme heat mean "the most dangerous fire weather conditions that Southwest California has seen in the past few years," forecasters said. Dr. Scott Witt of Sutter Santa Rosa Regional Hospital used a motorcycle to reach eight premature babies as the Tubbs Fire raged last week. Witt lost his home. Preliminary estimates indicate the fires burning in Northern California caused an excess of $1 billion in damages, and that figure is expected to rise. The number of deaths in the wildfires burning in Northern California has risen to 42, and 50 people remain missing in Sonoma County. California's $110 billion wine industry attracts 23.6 million tourists a year — but locals now worry those tourists will take their dollars elsewhere. Reminders of the deadly fires that ripped through wine country are virtually everywhere in the Northern California city of Sonoma. California residents began the emotional return to their wildfire-ravaged neighborhoods as evacuation orders were lifted. At least 20 wineries sustained damage, the Napa trade association says. With evacuations still in place, many are just now assessing the damage. As firefighters battled Northern California's blazes, Sgt. Brandon Cutting recalled racing through fire and embers to grab people from their burning homes. Calmer winds offered northern California a slight break from the raging, deadly wildfires even as they continued to burn 217,000 acres, authorities said. A couple jumped into a pool to escape the raging wildfire around them for hours, but it wasn't enough — the husband held his wife as she took her last breath. The Weaver family believed their beloved dog, Izzy, had perished in the California wildfires, but she emerged alive and happy and is now reunited with them. An interactive map, created by Robin Kraft with data from Digital Globe and help from Mapbox, shows Santa Rosa neighborhoods destroyed by the North Bay fires. Wildfires in California's wine country continued burning Saturday, fanned by increased winds and leaving nearly three dozen dead. Rick Grenis and Bonnie Frazier were determined to have the wine country wedding of their dreams, defying the devastation caused by deadly wildfires. At least 35 people have died in fires in northern California, including the state's wine country, and thousands of homes and structures have been destroyed. "Some of the air quality readings are-off-the-chart bad. There are people who didn't even have issues before that are experiencing issues now." Millions of dollars of pot crops are going up in flames — and because marijuana is still illegal, the farms have no insurance. Exhausted firefighters continued to fight the 21 firestorms raging simultaneously across the state's wine country, including Napa and Sonoma counties. 'There was little time to notify anybody by any means,' said state fire agency Chief Ken Pimlott. 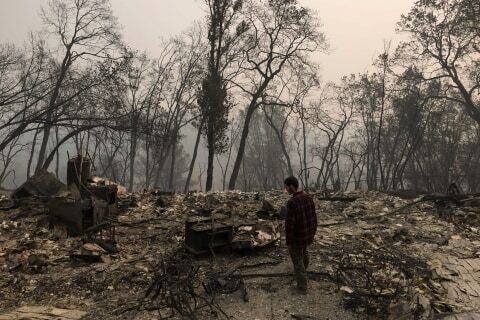 All that remained in some lots in suburban Santa Rosa, California, were scorched washing machines and ash-covered cars. Aerials show the devastation of Santa Rosa in Sonoma County after wildfires swept through the area. Weather that's exacerbated wildfire conditions will persist for at least two more days, and a fire official said, "It's going to be a long haul." Authorities continued to struggle with containing the firestorms raging simultaneously across the state's celebrated wine country. 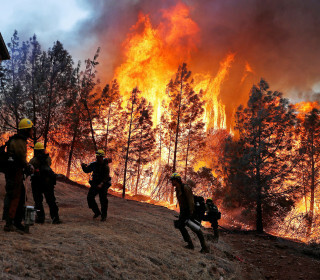 More than a dozen wildfires, fed on powerful winds, raged through California wine country. The deadly wildfires in California have put the state's prized wineries in peril, destroying at least two and threatening numerous others. Scientists generally agree that man-made climate change has exacerbated the drought and high temperatures that are fueling California's deadly wildfires. Firefighters were counting on cooler weather and weakening winds Tuesday to help in their fight against at least 17 large blazes. Montana came to understand the power of ice and fire this week, as it dealt with snowfall and a wildfire at the same time. Winds wreaked havoc on wildfires that were pushing the flames toward manmade and natural icons in and around Glacier and Yosemite national parks Monday. Cooler temperatures, rain and lighter winds allow 90 percent of the 1,400 people who were evacuated to return home. Authorities reported strong progress fighting the La Tuna fire, believed to be Los Angeles' biggest ever. Gunfire on public land sparked the massive Detwiler Fire near Yosemite National Park that destroyed more than 60 residences, fire officials said. Authorities lifted an evacuation order for a Southern California wildfire on Sunday as a second blaze in Central California grew. The Detwiler fire, burning in Mariposa County, California, had scorched more than 45,000 acres and was 7 percent contained by Wednesday afternoon. The raging Detwiler fire prompted Gov. Jerry Brown to declare a state of emergency for Mariposa County, home to about 17,400 people. More than twice as many acres were burned in the first six months of 2017 than at this point last year, officials said Monday. A brush fire in Santa Clarita climbed over hillsides north of Los Angeles and spread to about 750 acres Sunday, forcing freeway closures and evacuations. Investigators are still determining who is responsible for the line. The fire scorched 75 square miles in the Lake Isabella area and killed 2 people. The fire in the Cajon Pass in San Bernardino County was 85 percent contained Sunday night. The fire in the Cajon Pass was 65 percent contained, but another fire elsewhere in the state approached the historic Hearst Castle, officials said. The fire in the Cajon Pass east of Los Angeles started Tuesday and exploded in size, covering more than 57 square miles. 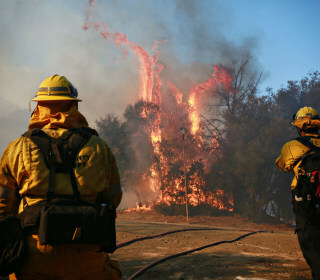 More than 700 firefighters fight the Blue Cut fire 60 miles east of Los Angeles which has burned at least 30,000 acres. The fire is being driven by winds and dry conditions, and more than 34,000 homes and 82,000 people are affected by evacuation orders. A fast-growing, minimally contained 25,000-acre wildfire in California triggered a state of emergency and the evacuation of 82,000 people. The governor declared a state of emergency amid the fast-moving Bluecut fire raging in the Cajon Pass. A highway was shut down and homes have burned. Damin Anthony Pashilk was charged with 17 counts in relation to several fires, including the raging Clayton Fire. The Clayton Fire ignited Saturday evening off Highway 29 near Clayton Creek and south of Lower Lake in California's Lake County, officials said. Four people were killed and more than 1,300 homes were destroyed in the 2015 Valley Fire, the third-most destructive fire in state history. The Soberanes Fire has left one person dead, dozens of homes burned and had ballooned to 38,000 acres by Sunday morning. The so-called Sand Fire has charred 59 square miles since it broke out last Friday in a mostly rural area. Once the Soberanes Fire flared up over the weekend, the men said they were stranded and didn't know which direction would lead them to safety. The so-called Sand fire in the Angeles National Forest has grown to nearly 37,500 acres since it was first reported on Friday. The so-called Sand fire keeps growing — it's at more than 33,000 acres so far — fueled by dry brush, soaring temperatures and winds. The so-called Sand Fire north of Los Angeles was at 11,000 acres at noon Saturday and grew to 22,000 acres by Sunday morning. The fast-moving Sand Fire that broke out in Santa Clarita continued to burn Saturday as at least 300 people were told to evacuate. The bill would let authorities to disable and crash drones flying too close to firefighting efforts. The state would be the first to do so in the U.S. It has not been confirmed that the two bodies found near the Border Fire in the area of Potrero were killed by the blaze burning since June 19. Hot, dry weather has fueled several fires, but fire authorities said most were in hand except for one: a 37,000-acre blaze in central California. The Erskine Fire in California's Sierra Nevada Mountains killed at least 2 people and destroyed 150 homes. Two people were killed in an explosive wildfire burning south of California's Sierra Nevada mountains in rugged terrain amid hot, dry conditions. Fire officials confirm two people were killed in a wildfire that broke out Thursday and exploded in size, consuming at least 50 homes in California. The fires had grown to a total of 8 square miles, and authorities worried they could soon combine into one monster blaze. It was hot enough to fry eggs on the sidewalk in Arizona as summer started off with searing temps across Southwest.